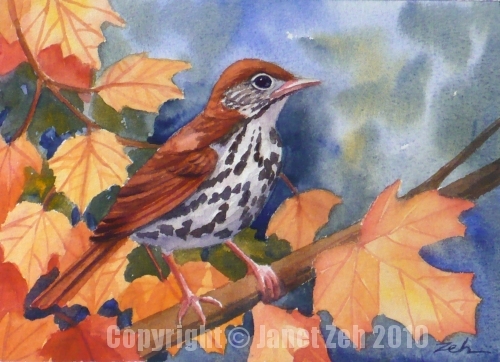 All summer long, I have enjoyed the clear, flute-like song of the wood thrush emanating from the woods around my studio. Each time I heard it, I thought of painting this bird. But here it is almost September already and the maple leaves are starting to turn. The thrush will soon be on its way to Panama. So to catch it before its migration, I've done this painting of a wood thrush among the colorful leaves of a maple tree in early autumn. The original has been sold, but check my Etsy shop for more of my bird art. Thanks for stopping by and have a beautiful day!